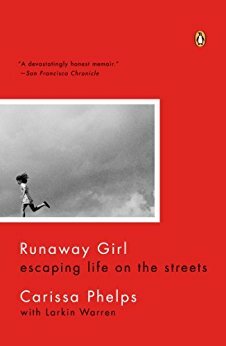 RUNAWAY GIRL | Source MN, Inc.
A book review by outreach volunteer Joy Spencer. Carissa Phelps came from a difficult family situation. Her stepfather treated his stepchildren more severely than his biological children. Her mother loved babies but was emotionally absent as her children grew. There were also just too many kids in a crowded household. Carissa was a rebellious child who didn’t like anyone telling her what to do. She ran away when she was expected to follow rules. This deadly combo put her at great risk. At the age of 12 she became prey to a brutal pimp. Her harrowing story of some of the ways he treated her is difficult to read and beyond imagination. The pimp was eventually imprisoned but Carissa continued to run. She spent a lot of time in juvenile hall. When she got out they would put her in a foster home and she would run again. Even though she was very bright, she did not spend much time in school. It was too much fun to party and be on the run. The good news is she had a praying grandmother and Grandma’s prayers were answered. A math teacher who saw potential underneath her rebellious attitude encouraged and challenged her. An astute counselor knew just how to talk with and support her. With the help of that teacher and counselor, Carissa put her intelligence to work graduating from UCLA with both a law degree and an MBA. She now puts her energy and attitude to work helping homeless and at risk youth. For more information about the work of Source anti-trafficking visit the Anti-trafficking tab on this website.